Kelly’s dialogue in panel one is a reminder that the Heirotus Corporate Security Service, like most militaries, has a budget. While the Colonial Authority Security Service enjoys taxpayer funding in the backing of the state, the HCSS is financed entirely by Heirotus. The Sabrosa is at the end of a deployment, so consumables – including spare parts – are at a premium. Resource scarcity means occasional tradeoffs – in this case Thad is receiving a lower standard of care than he could be given, as all evidence indicates that the alternative is to burn through equipment that is in short supply. Panel one is a bit off from my usual obsessive precision camera arrangement – as much as I love a perfect one-point perspective shot, trucking the camera a bit to the left worked better for Kelly and just as importantly made sure Thad was very off camera. Panels three and four were composed with the same requirement – keeping Thad out of the shot. This page features the last money shots of the sickbay corridor. This is far from its last appearance, though from here on out it’s seen only in bits and pieces. The rest of this scene is anchored in sickbay compartment C2. I still haven’t decided on a posting regime for the current chapter. The server ATC currently resides on experienced hair-pulling existence issues when the first two pages of the chapter were posted – since then I’ve decided it’s probably a good idea to post during weekdays, when there’s someone around to keep the hamster wheel spinning. The next two pages are ready to shade so at this point that’s two more weeks of guaranteed updates – I’ll start thinking about multiple pages a week when I can get the production pace ratcheted up to something that at least resembles a production pace. 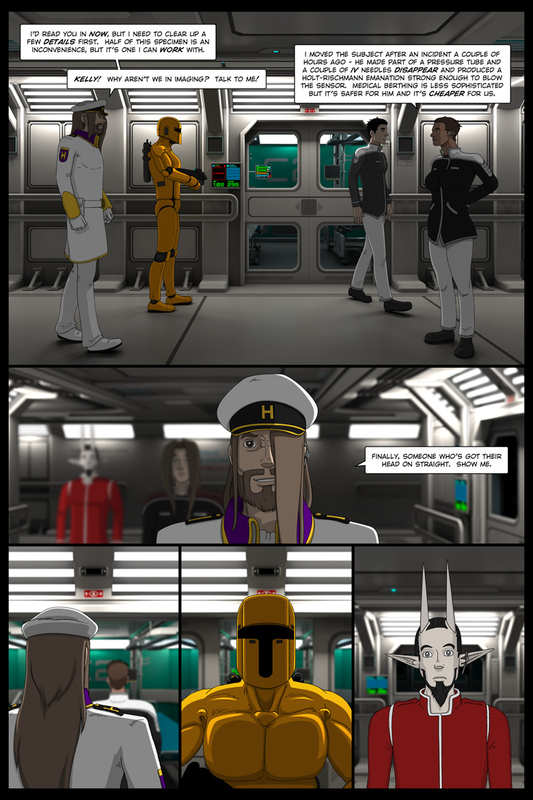 I participated in #WebComicChat this past weekend – that’s the first I’ve loudly plugged ATC in quite awhile. The tweets resulted in a bit of site traffic, which is more than it would have gotten had I not happened to check Twitter around the time it was happening so I’d call it a win. Considering just how big a problem self-promotion is for me I’d call it a huge win. 110 queries in 0.792 seconds.